So this year I've been loving smoothies and juices. For Christmas I got a blender so it stemmed from there, also lots of Instagram posts have had a huge influence. 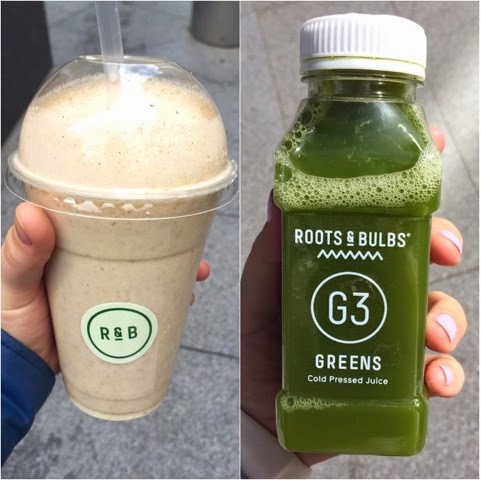 Towards the end of April I was back in the game, eating clean and on the smoothie/juice hype. 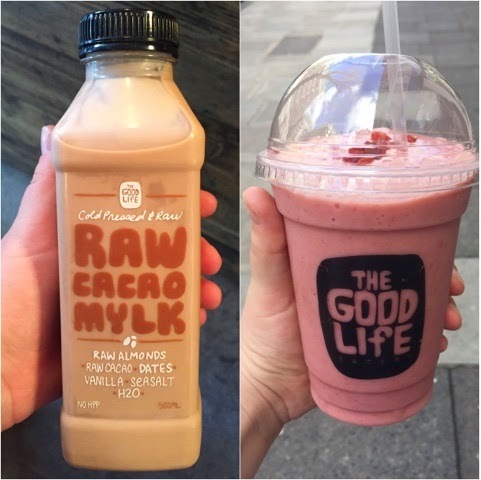 I wanted to share with you my top 5 places to grab a juice and/or smoothie. 1. The Good Life Eatery. This was a clear winner and I LOVED their Pink Panther. This was a smoothie with Strawberry, Raspberry, Rice Milk, Avocado, Baobab Powder, Gluten Free Oats, Madagascar Vanilla and Sun Warrior Vegan Protein. Lots of great ingredient and so many yummy flavors. Whilst I was there I opted for their Raw Cacoa Mylk with raw almonds, raw Cacoa, h2o, sea salt, dates and vanilla. I'm not huge on dates but this still tasted good and knew it was super good for me too. The Good Life Eatery is small so I can imagine it's difficult at times to get a seat but you can always take away. The staff work super hard and it is very clean and pretty inside. I cannot wait to go back and taste their brunch menu. Check out their website here! 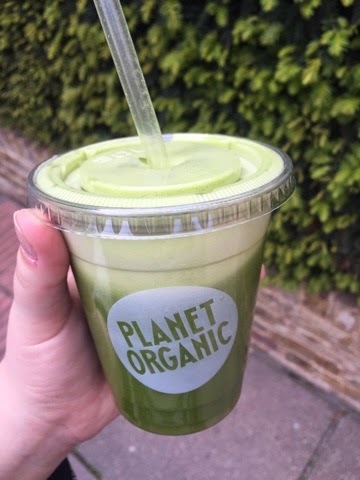 I only found Planet Organic recently and I am so pleased I did. It is very similar to Whole Foods. Their menu is extensive and the service is quick. I opted for the Cleansing Greens which consisted of cucumber, apple, spinach, parsley and lemon. It was super refreshing and my new all time favourite green juice. When I went it was at the peak of lunchtime and in the city so the staff didn't have much time to chat but that didn't affect how amazing the juice was! I visited the branch close to Bank and there is a lovely seating area if you want to sit in. 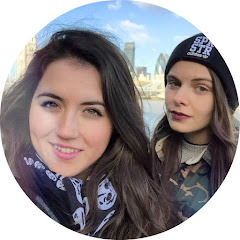 Have a look at Planet Organic here! So if you haven't tried this delightful place you must go there. 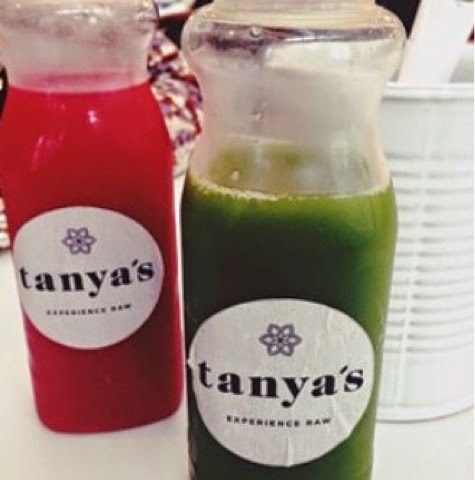 The staff are super friendly and the juices and smoothies taste phenomenonal. The first ever time I went I opted for their G3 greens pressed juice. With Cucumber, spinach, romaine, apple & herb. Then I went back to try out their smoothies and had a 'Whey of Gods' with almond milk, banana, maca, peanut butter and Protein Powder! 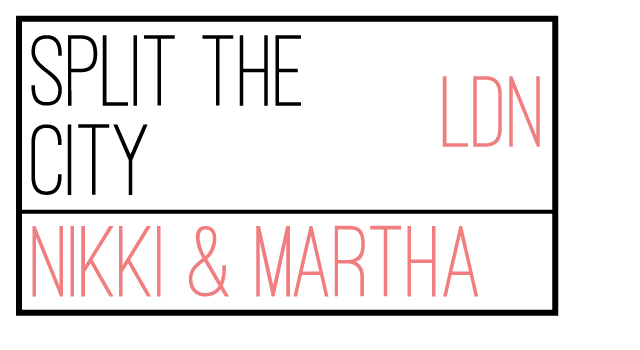 They have several branches across London and I am going to make of my mission to visit them all. Check Roots and Bulbs out here! I went to Tanya's a while back and I can't wait to go back. It is just beautiful. I loved it there. The staff are all so happy, positive and helpful. And the juices are incredible. I also ate there and the food is so healthy and yet so tasty! I always find it so refreshing when places are so creative and make it fun to eat clean. The juice I went for was The Alkaliser, with Kale, Spinach, Lemon, Cucumber and Apple. The interior of Tanya's will make you want to visit alone. It is really well looked after and a perfect healthy place to visit. Take a look at Tanya' here. I had the put this on my list because, as much as I love trying new juice/smoothie places, it is a lot more economic to make them at home and I am really enjoy being able to try out new combinations. I have some little jars that I pour my smoothies into as well so it makes it easy to take around with me if I'm out and about for the day. 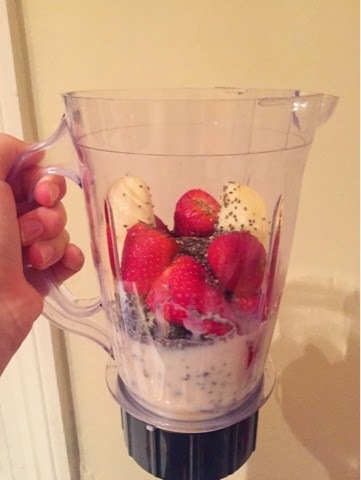 My favorite that I have tried out recently was inspired by Delciously Ella which is: Almond Milk, Strawberry's, Banana and Chia seeds. I hope you enjoyed reading my top 5 places for Juices and Smoothies. If you have any flavors or places that you think I MUST try please let me know, I would love to hear from you.